Saltaire, Salts Gallery, Roberts Park and the Shipley Glen Tramway. Free parking is available at Salts Gallery or in the bus turning circle at the Titus Salt School on Higher Coach Road. Parking in Saltaire Village is problematical. Saltaire Village is a UNESCO world heritage site, being the village Sir Titus Salt had had constructed for his workers when he moved his mill from Bradford to a greenfield site. The Gallery is in the mill. There are displays including the Hockney Gallery. There is a large shopping area selling all manner of “arty” type things and books. There are two good cafes/restaurants serving full meals if required. On leaving Salts mill at the opposite end of the building from the car park access to Victoria Road leads to the village, with more shops and cafes (uphill to the left); or to Roberts Park and the Shipley Glen tramway (down hill and across the footbridge to the right). Cross the park to Higher Coach Road and a public footpath leads to the lower station of the world’s oldest funicular railway. Shipley Glen is a further 0.25 mile walk for the top station. Information supplied by Cedric Binns. Special events in addition to regular weekend service. the “Day Rover” ticket gives free admission to the Vintage Carriage Trust’s Museum of Rail Travel and the Bahamas Loco Museum, both at Ingrow. Special events (inc Thomas) in addition to regular weekend service. There are two miniature railways not far from the Richard Dunne Centre. 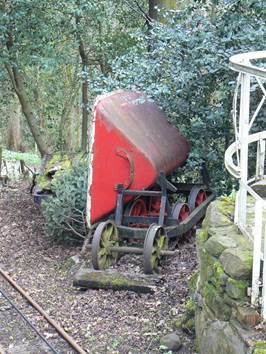 Shibden Hall/Park in Halifax has a 0.75 mile miniature railway. It is only about 5 miles just off the direct route to Halifax from the large Odsal Top round-a-bout near the centre. 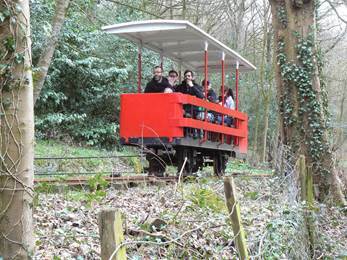 Whilst it does not have a website it has a facebook page entitled “Shibden Railway” open at weekends 11am to 4pm (ish). The contact telephone number is 07854658635. The address of the park is Godley Lane Halifax HX3 0AQ. Bradford Model Engineers have a couple of tracks at Northcliffe Woods just off the A650 Keighley Road at Shipley. However they only advertise being open to the end of September.